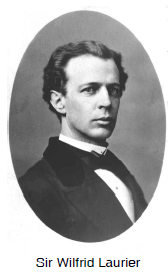 Wilfrid Laurier was born on November 20, 1841 in Quebec. He was the descendant of settlers who came to Canada from Normandy two hundred years before. Laurier spoke fluent French and English and became the first French Catholic prime minister of Canada in 1896. He led the Liberal party to success for the next 15 years. This was partly due to the good economic times the country enjoyed in the first ten years. It was also partly due to Laurier's skill as a compromiser. It was under Laurier's leadership that the Liberals became a strong party uniting the old Parti rouge of Quebec and the Grits of Ontario. One of Laurier's early challenges was the Manitoba Schools Question which had been simmering since 1890 and required a balancing act between French and English and between federal and provincial governments. Laurier was a strong spokesman for greater independence from Great Britain. He argued that Canada should make its own treaties, settle its own border disputes and make its own decisions about following Britain into war, an issue which came up with the beginning of the Boer War in 1899. Laurier was also an early free trade: trade across borders without tariffs or restrictions.free trader, winning one election on the issue of reciprocity: a mutual exchange, especially an exchange of special privileges in regard to trade between two countries.reciprocity with the United States, and losing another on the same issue in 1911. Laurier died in Ottawa in 1919, but not without leaving a strong influence on his successor, William Lyon Mackenzie King. For further reading see Sir Wilfrid Laurier and the Romance of Canada by Laurier LaPierre (Stoddart Publishing).